Balanced blood sugar helps us to regulate overall energy levels, keep total weight in check, and prevent cravings that can lead to overeating. It is something we should all pay attention to on a daily basis as we strive for lifelong transformation, one healthy habit at a time™. Outlined below are some daily habits and healthy regimens from eatingwell.com that may help regulate your blood sugar. Eat six times daily. According to Harvard Health, this is critical when it comes to balancing blood sugar. Meals that are more frequent (every 2-4 hours) can help you with taking the weight off, controlling hunger, reducing blood insulin and lowering cholesterol. Balanced meals are important. On a daily basis, it's important to eat meals and snacks that contain select vegetables and the right amount of protein, as this provides good nutrition that will help you feel full while keeping blood sugar levels within normal ranges. Keep moving. Exercise and movement also help to normalize blood sugar and promote weight maintenance. Try to work in 30 minutes of light to moderate exercise, such as walking, yoga, or Pilates per day. You'll see, and feel the difference. Sleep is critical. Individuals with poor sleep habits may suffer from more erratic blood sugar levels. Aim for the recommended 7-8 hours of sleep per night to benefit your overall health and to keep your body fresh. 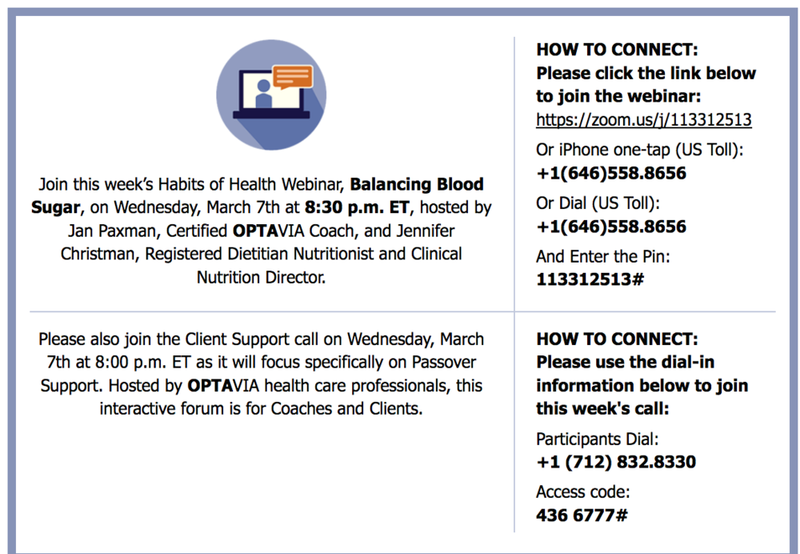 Click the link below to join this week’s Habits of Health Webinar, Balancing Blood Sugar, on Wednesday, March 7th at 8:30 p.m. ET, hosted by Jan Paxman, Certified OPTAVIA Coach, and Jennifer Christman, Registered Dietitian Nutritionist and Clinical Nutrition Director. Older PostThere Is Nothing Sweet About Diabetes . . .